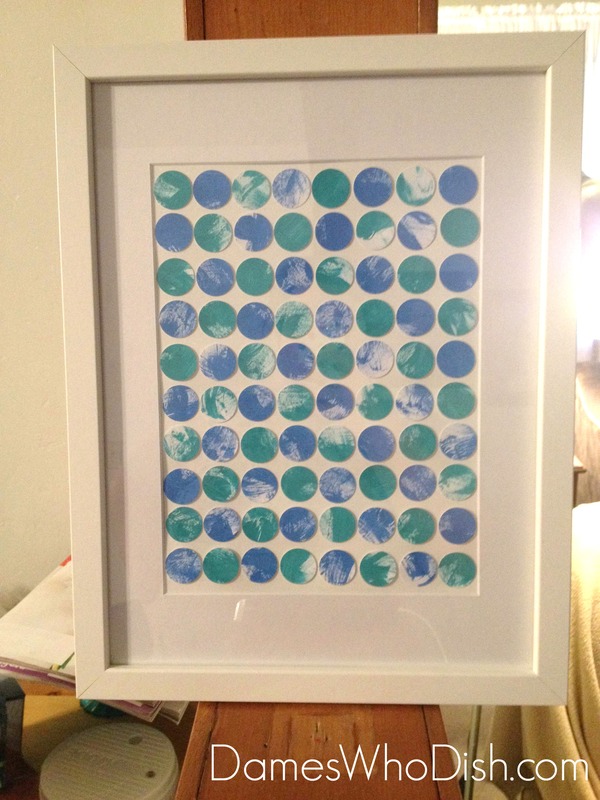 I’m constantly pinning new ideas for arts and crafts projects on Pinterest – especially ones to decorate my woefully under-decorated apartment. So, when I saw this example, I knew I had to try it. 1. 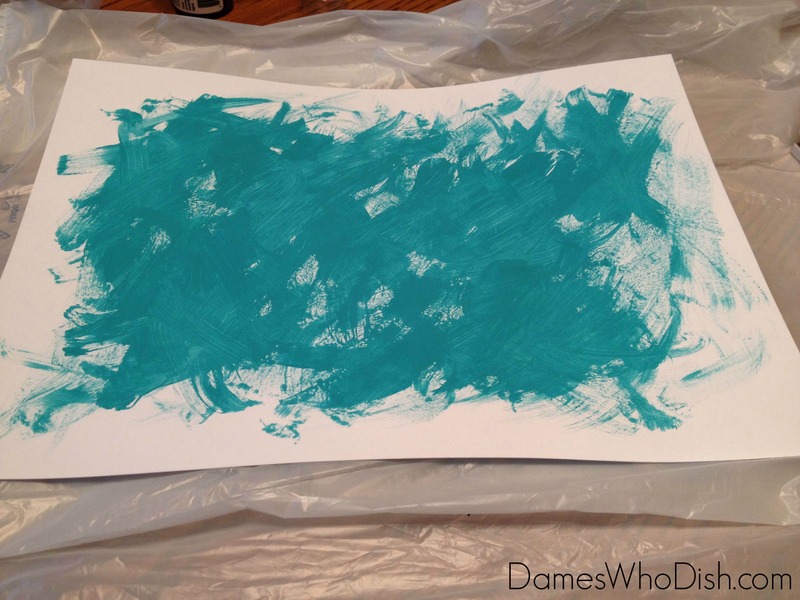 I chose two colors to use, blue and teal. I painted strokes of each color on two different pieces of card stock, purposely attempting to make variations in how the paint looked on the page. 2. 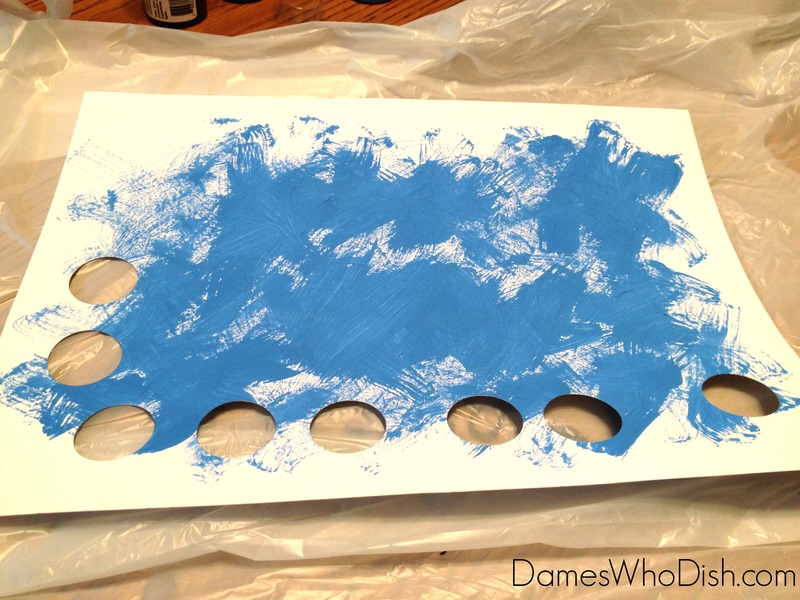 Once the paint dried, I took the large whole punch (the one I have is Martha Stewart brand) and began punching holes and setting the circles aside. 5. 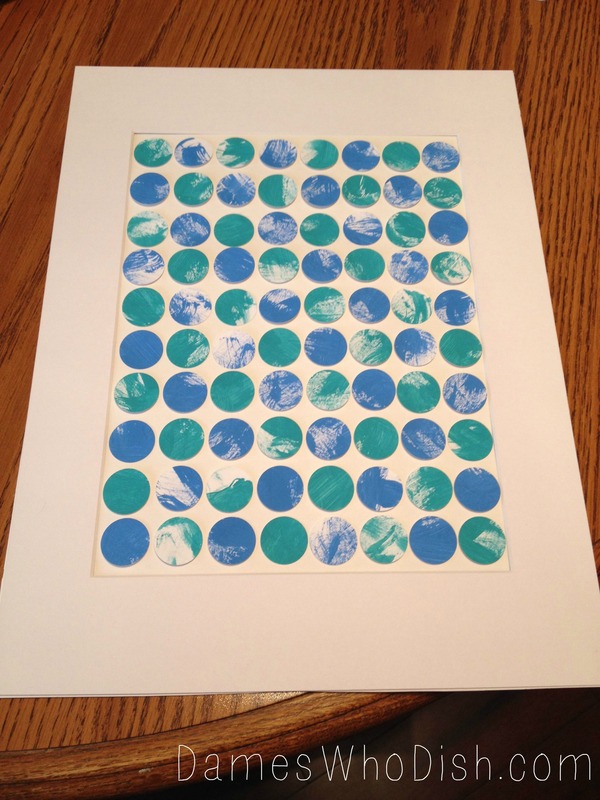 Next, arrange the punched out circles on the poster board. 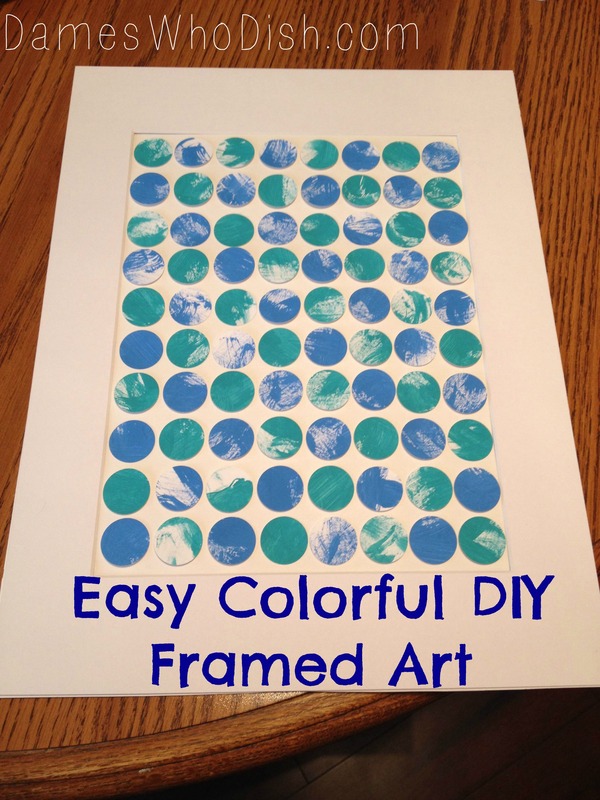 I purchased a large piece of poster board, cut it to fit the frame and then taped the matte to the poster board so that I could accurately place the circles. 6. 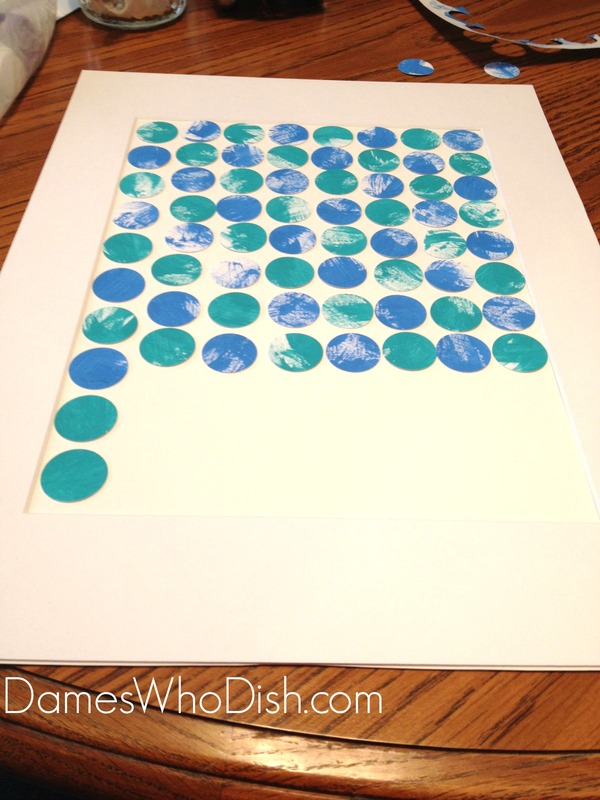 After laying out all of the circles in order to get the spacing right, glue each circle into place. 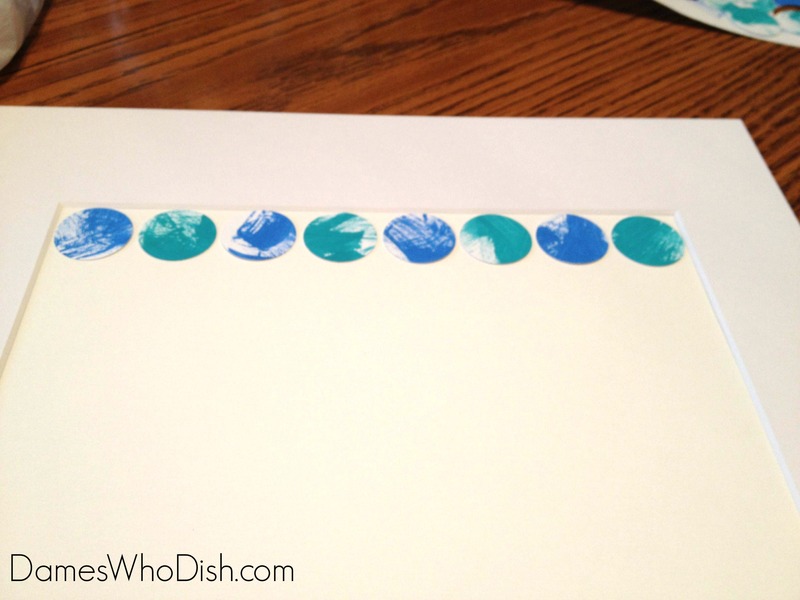 And, voila – easy, colorful art! Sometimes I feel like I get into a recipe rut on here, only cooking and providing you with recipes and cooking tutorials. I really love to craft too and with the abundance of ideas that Pinterest provides, there are so many things I want to try. 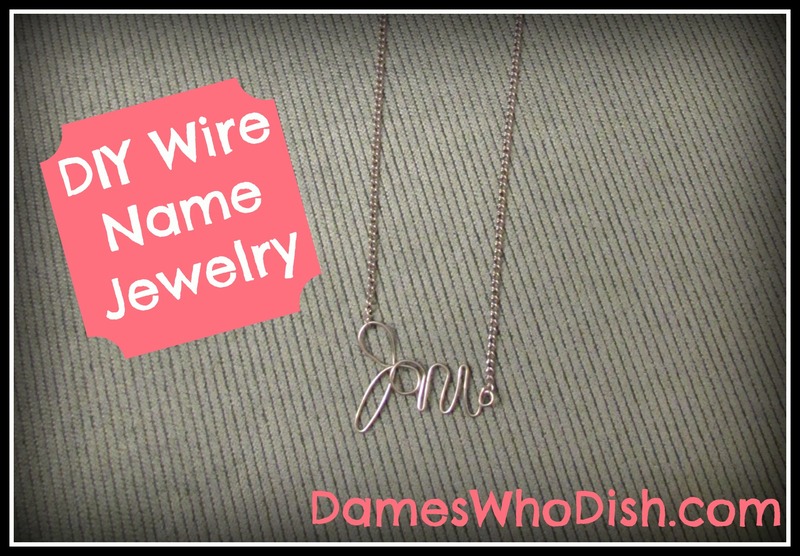 So this past week, I decided I was going to try out making wire name jewelry. It was neither as easy nor as hard as I thought it might be, but I really loved the end product. Making wire jewelry takes some practice, but it also takes thought and planning. Some letters, names, and words will be easier than others. Prepare to fail and try again. You will get the hang of it. Just make sure that you buy extra wire so that you can practice. 1. Start with a piece of paper and pen. Think of the word you want to make and write it out in one continuous line, without ever lifting the pen from the paper. 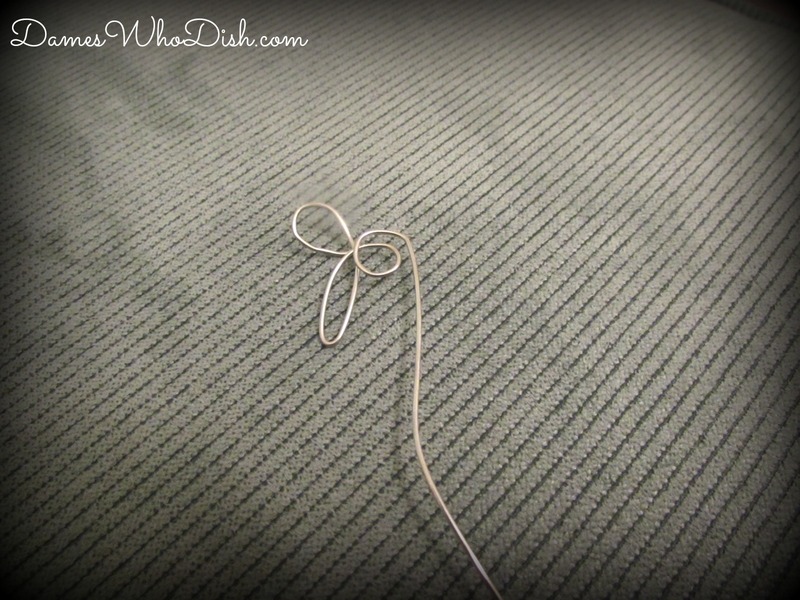 Remember, the wire name you will be making has to flow and can’t be joined together. (Unless you plan on soldering the metal together –which is something else entirely. NOTE: A vital piece of designing your piece of jewelry is to think of how you are eventually going to wear it. How will you hook the chain to the name? Include that in your design. 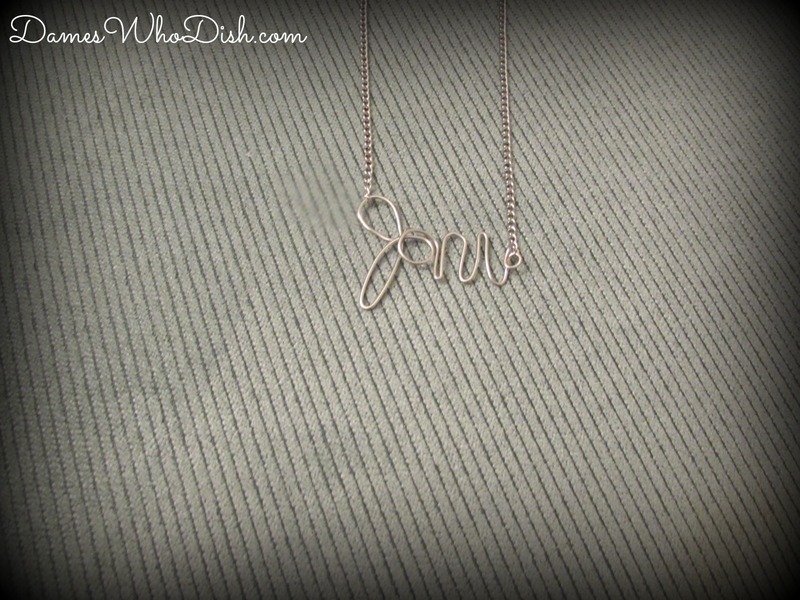 For example, with my necklace, I hooked one end of the chain to the J’s loop and then created an extra loop at the end of the i. 2. Once you figure out how you want to shape the name/word and you think you know how to shape it, you are ready to really begin. 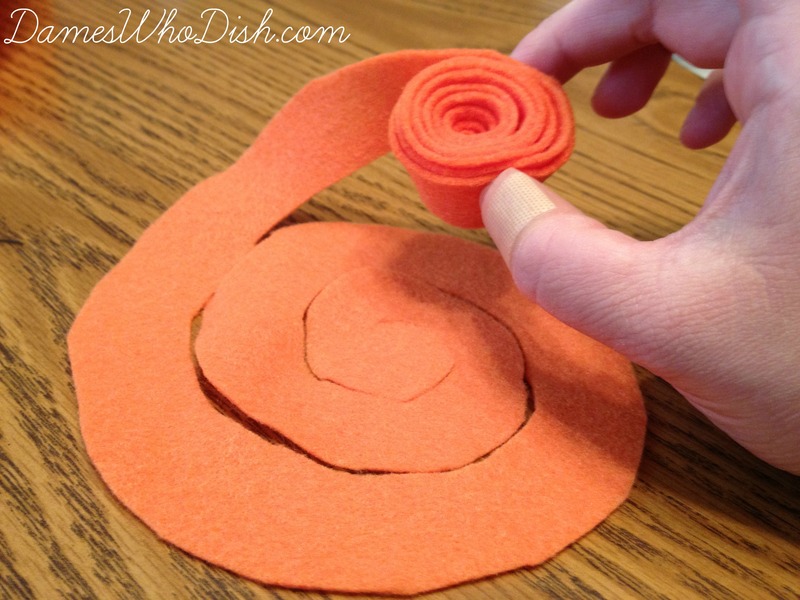 Take your coil of wire and cut a piece with your wire cutters. 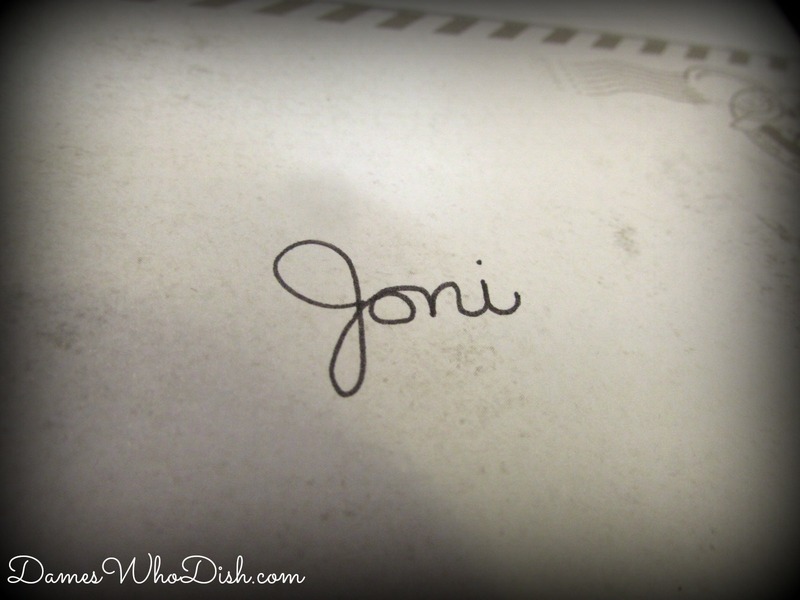 The length you will need depends on the length of the name/word you are creating. 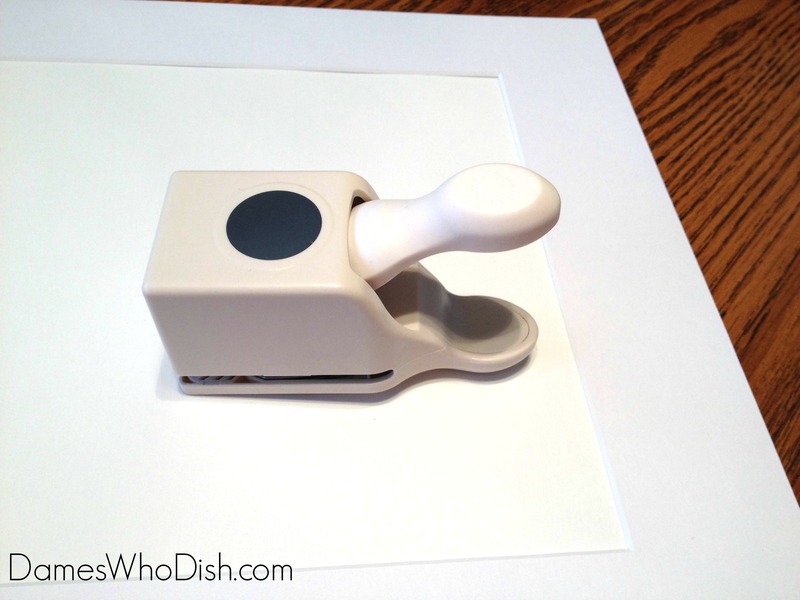 Extra is always good — you’ll just cut it off when you’re done. 3. Begin shaping your letters. Use both your fingers and the pliers. 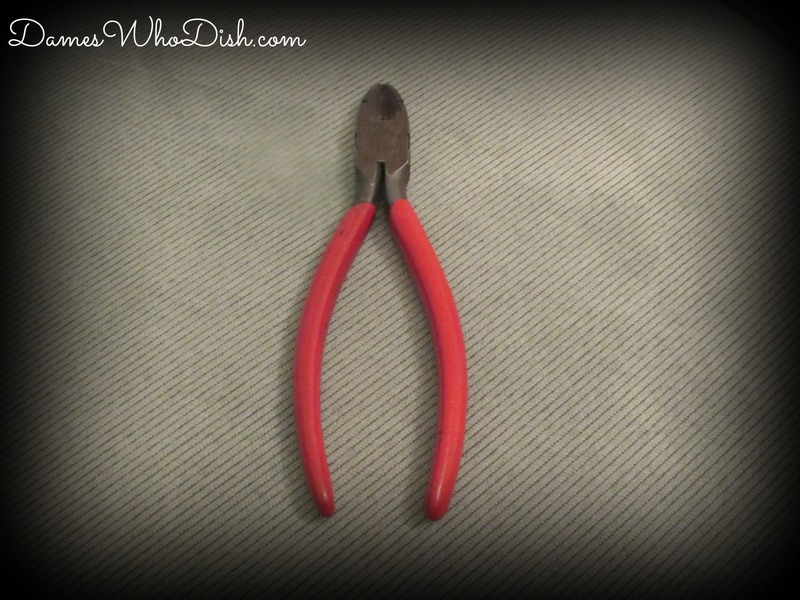 (The pliers are good to make curves and circles — just wrap the wire around the plier to shape it. 4. Continue to shape the letters. For some letters, you will have to double the wire up in order to get the look you want. 5. When you’re done, it’s time to hook the wire name to the chain. I chose to make mine into a necklace. I bought a ready made silver chain with clasp at the craft store and then pried it apart in the middle, reattaching it to the ends of the name. (This can be difficult if the chain links are small, so consider this when you design the piece. 6. And you’re done! For my name, I was really surprised how short an amount of time it took me. (It took longer to detach and reattach the chain than it did to actually form my name. But some letters are other words are more difficult. The bottom line is that practice makes perfect. You will also need a lot of patience. 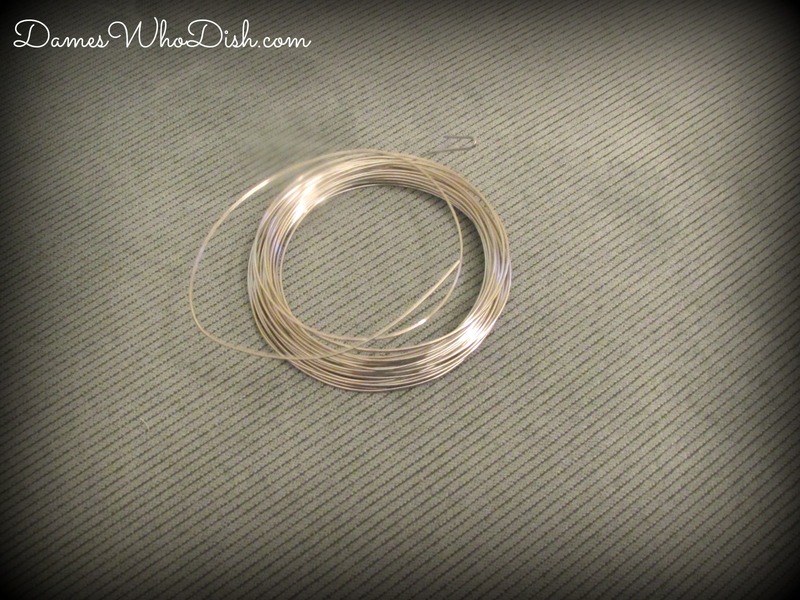 Jewelry wire comes in a variety of sizes and materials. I used simple wire from the cart store in the color silver. 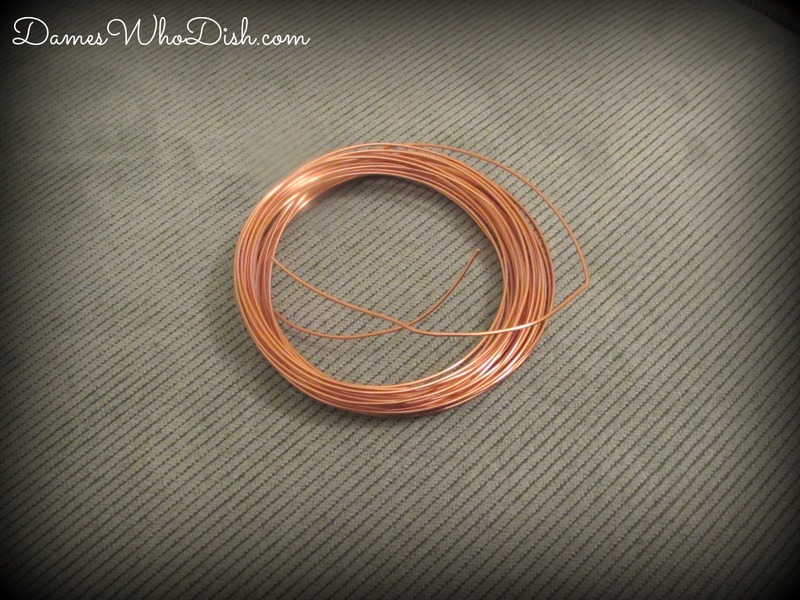 You can also buy copper wire (pictured below). Wire is sized by gauge — the smaller the gauge the larger the wire circumference. For name jewelry, you will want a lower gauge (under 20), so that it will hold up. 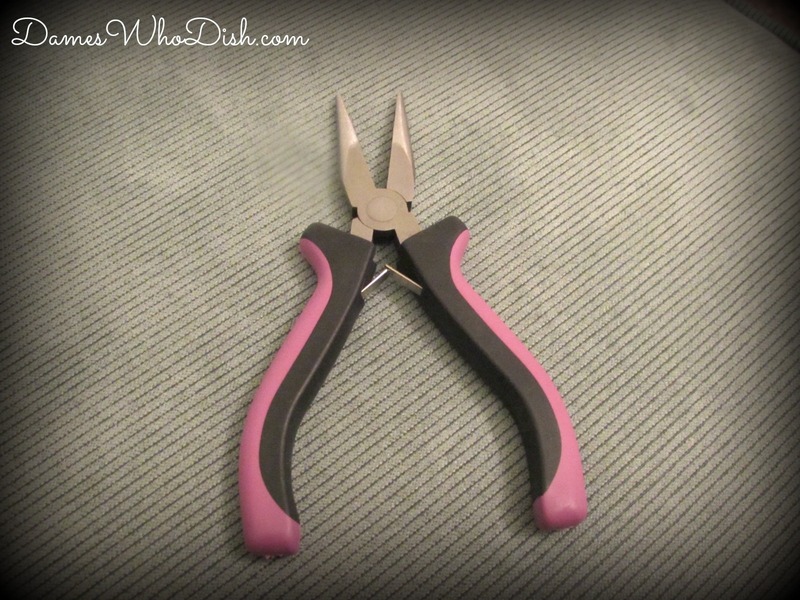 Jewelry pliers are sold in the craft store, but you may need to buy wire cutters from a hardware store. You can also make bracelets and rings with the wire. 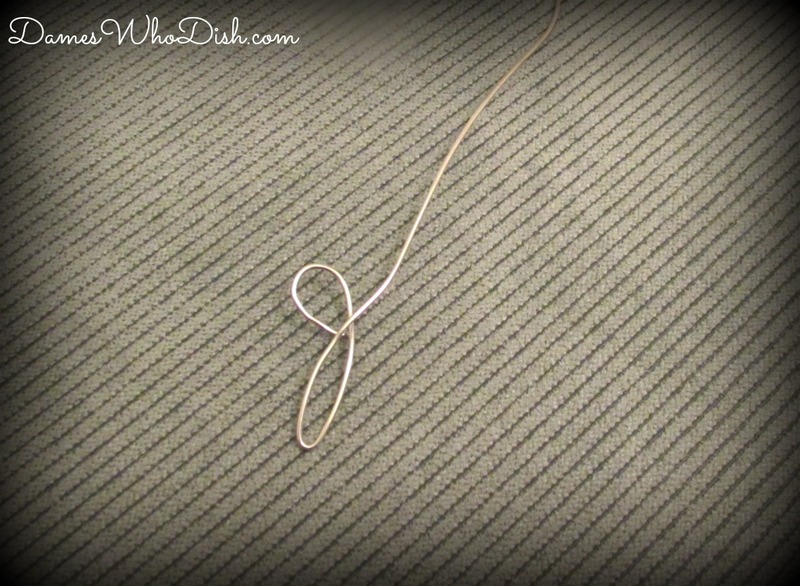 A chain and clasp is also not necessary for all pieces of jewelry — the wire itself can be used for the entire piece. Like it or not, summer really is over. Well, almost — only a few more days to go. So, in the spirit of Autumn and all things sweaters, leaves, mums, and cool weather, I decided to make an easy Fall wreath today to hang on the front door. I used a technique I’m currently using to make a different wreath, but for today’s project I simplified it further. A grapevine wreath (or one of a similar material) — I used 18″, but feel free to make a smaller or larger wreath. 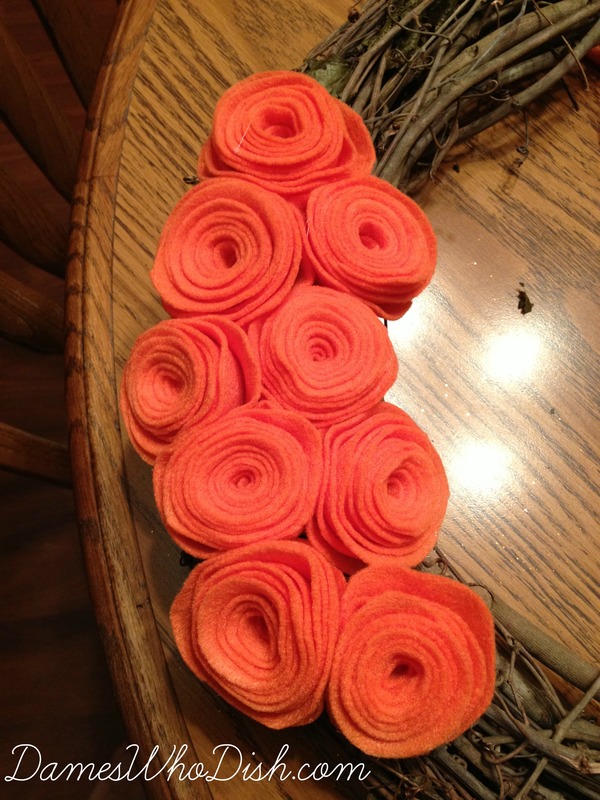 1/2 yard of Orange felt (or color of choice) — If you want more flowers, you’ll need more material. 1. 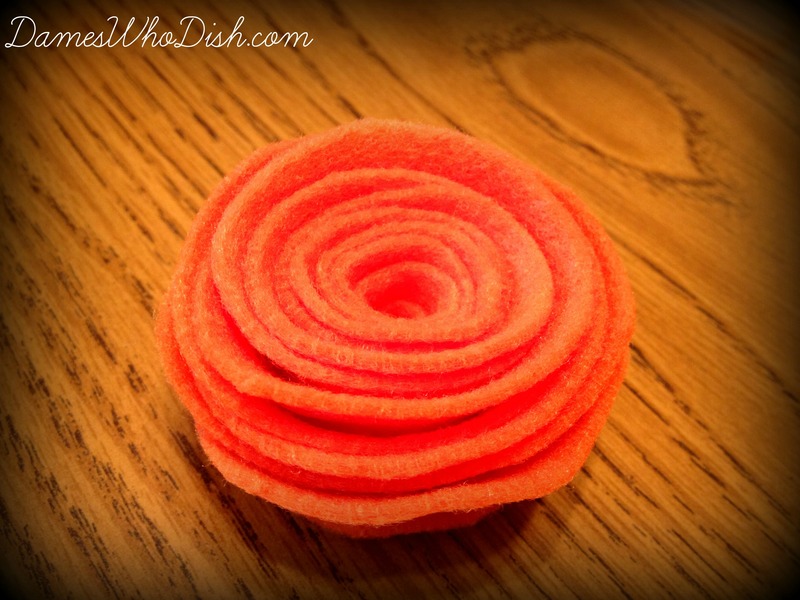 For this wreath, I made 9 large felt flowers, so you will begin by cutting 9 large felt squares. You can use a ruler to measure out each square, but I just free-handed it. It doesn’t have to be perfect. Just know that the larger the square, the larger the flower. 2. 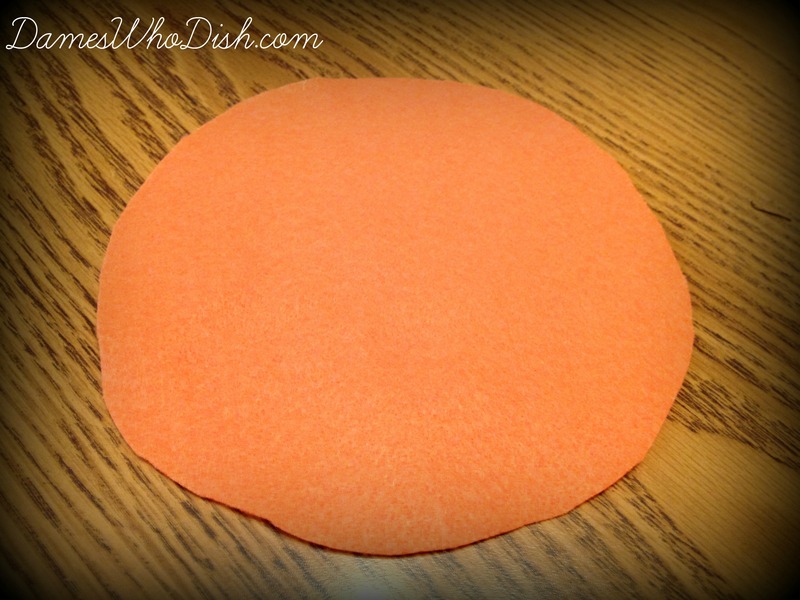 Cut each square into a circle. 3. 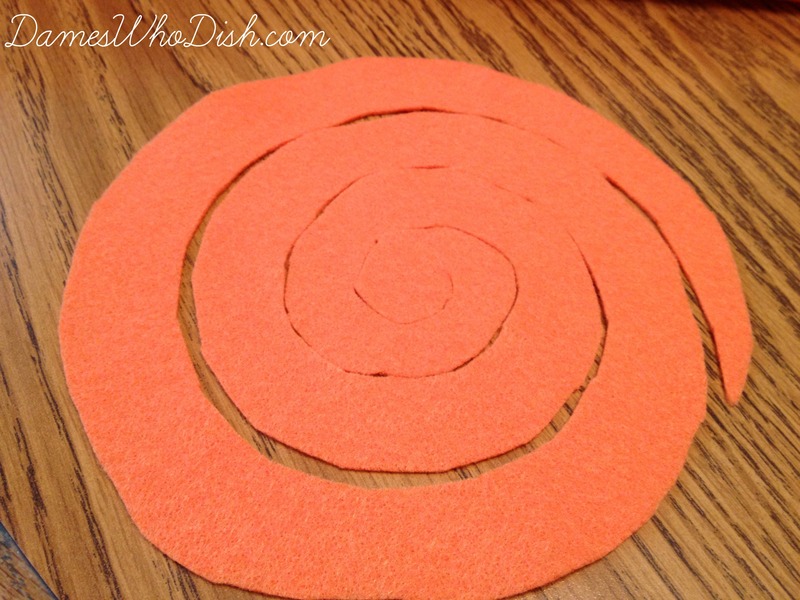 Cut each circle into a spiral. 4. 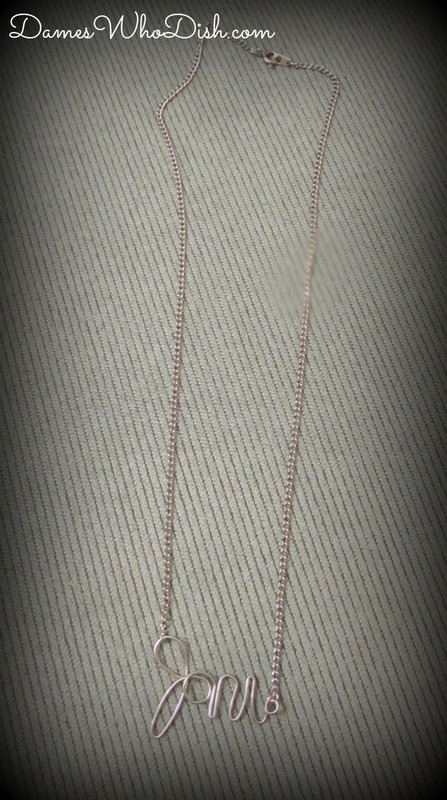 Starting on the outside, begin rolling the strip of fabric tightly. 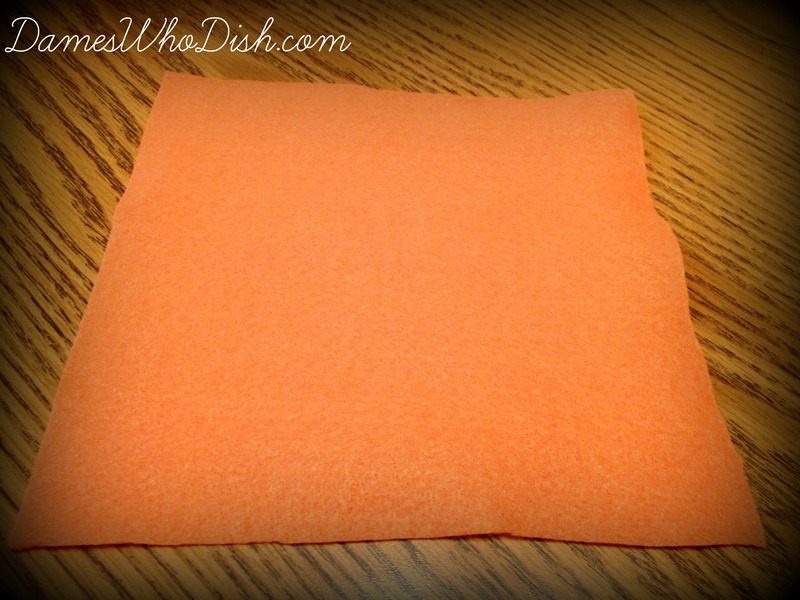 Continue until the fabric is completely rolled. 5. 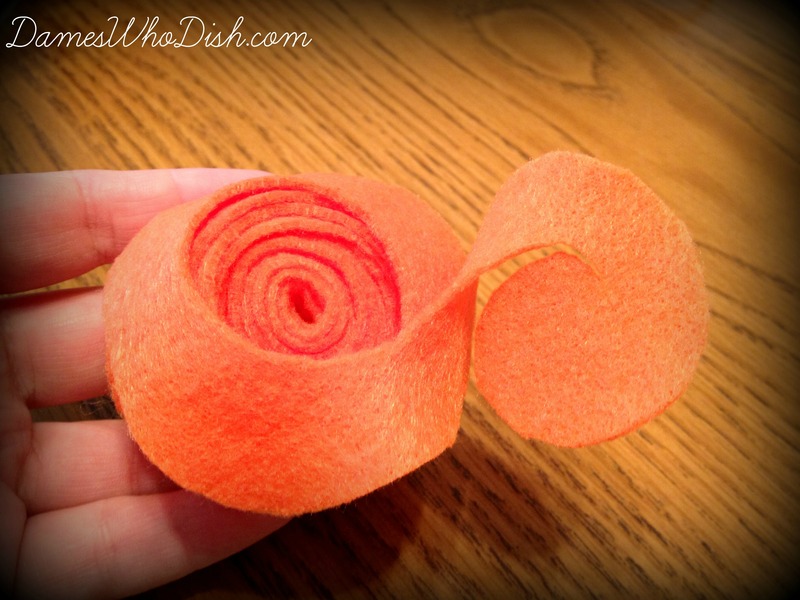 When the spiral is completely rolled, you will be left with the inside flap. 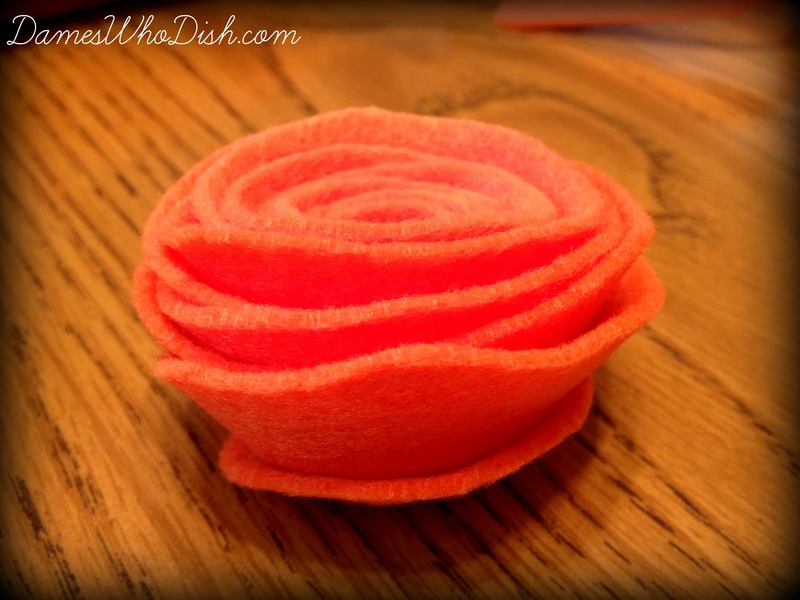 Apply hot glue to the underside of the flap and press it to the bottom of the flower. This will hold the whole thing together. Remember to handle hot glue and the hot glue gun carefully. 7. 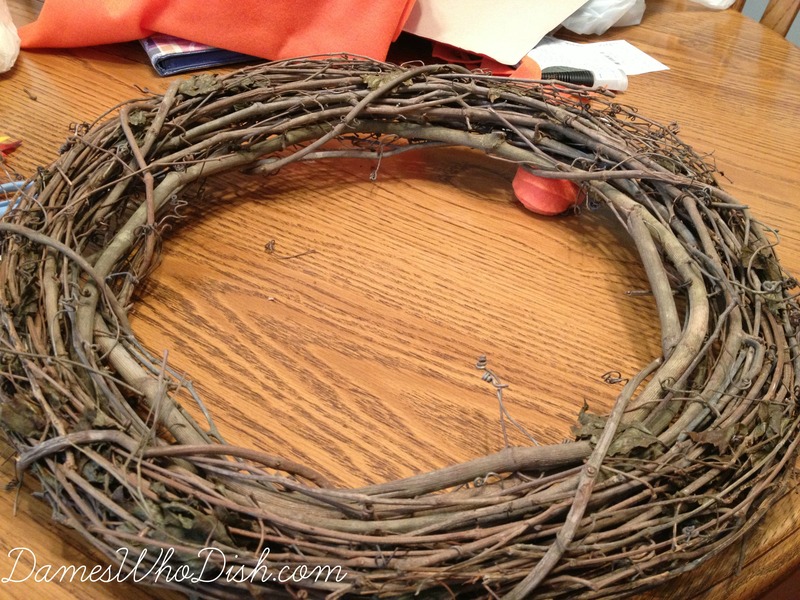 Take your grapevine wreath and begin arranging the flowers on the wreath. I decided to offset them to one side, but if you prefer another arrangement feel free to play with the placement of the flowers. 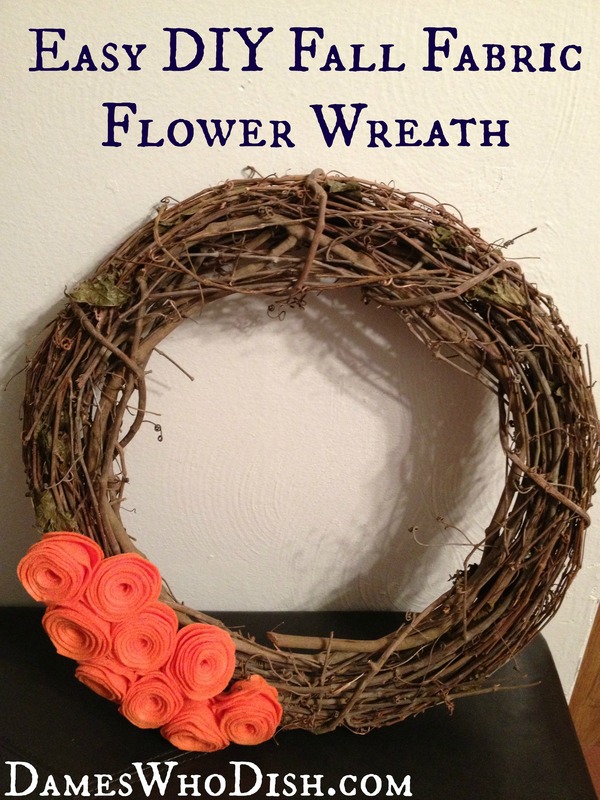 And there you are, an easy DIY Fall Fabric Flower Wreath.